Jupiter boasts some of the most powerful aurora in the solar system. Compared to the Earth’s aurora, it is a few hundred times more powerful and brighter in the all spectrum range. What causes Jupiter’s powerful aurora? Several hypotheses have been proposed, but it has remained a mystery due to a lack of observational evidences. Jupiter’s X-ray aurora, which is observed in the X-ray spectrum region, is thought to sparkle when oxygen and sulfur ion particles moving at nearly the velocity of light strike the Jupiter’s atmosphere. How can these ions be accelerated to such high speed? There are two leading hypotheses. The first one assumes that the solar wind speeding up the ions, similar to the case of the Earth’s aurora. 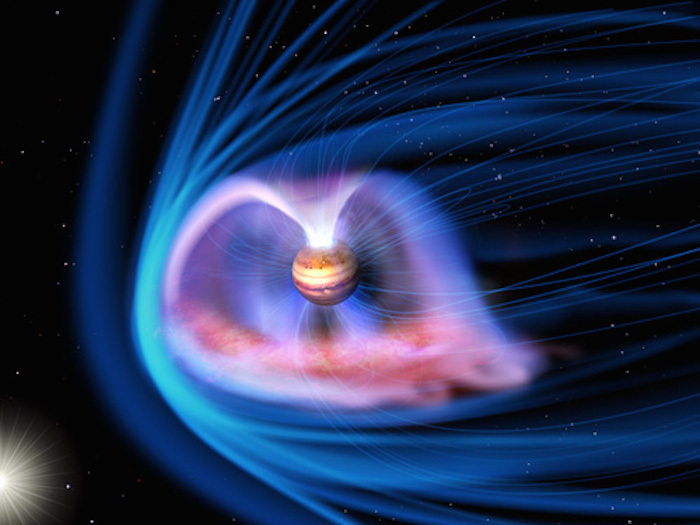 The other proposes that the ions are being accelerated by the rapid spin of the Jupiter, the Jupiter’s own magnetic field and plasma provided by the Jupiter’s satellite Io. Monitor observations of the Jupiter’s X-ray aurora are essential to compare several parameters of the X-ray aurora, such as brightness at each location, with the changes in the solar wind. For example, a correlation between the solar wind and the X-ray aurora supports the first hypothesis (the ions are accelerated by the solar wind) observationally. Using the Spectroscopic Planet Observatory for Recognition of Interaction of Atmosphere "HISAKI" (SPRINT-A), the Chandra X-ray Observatory and X-ray Multi-Mirror Mission (XMM-Newton), scientists monitored the Jupiter’s X-ray aurora for two weeks in April 2014. “We estimated the variation of the solar wind at Jupiter by HISAKI’s data. The data of the solar wind at the Earth was available. However, when this observation was conducted, Jupiter was in particular far from the Earth. The estimated pressure and velocity of the solar wind at the Jupiter location is much less accurate if we extrapolated these values observed at the Earth.” Kimura, the research team lead, explains. The results show the strong correlation between the velocity of the solar wind and the strength of the X-ray aurora. Although previous studies indicated the correlation between the pressure of the solar wind and the strength of the X-ray aurora, this is the first time to show the velocity of the solar wind affects the strength of the X-ray aurora. 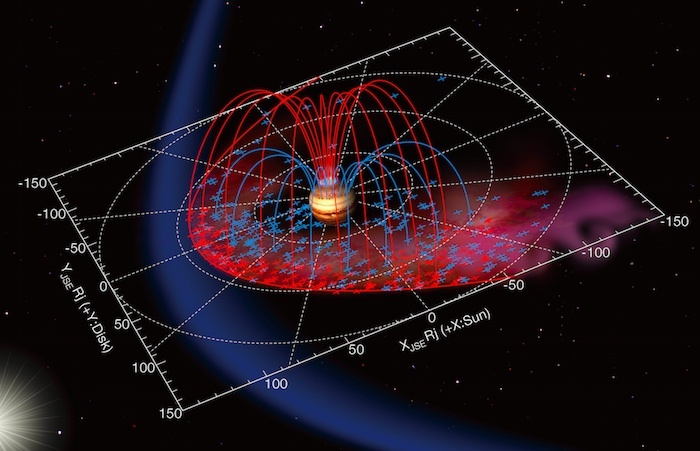 Since the Jupiter’s aurora at other spectral range is thought to get kicked off by the planet-moon interaction, not by solar activity, this study suggests the X-ray aurora sparks by different mechanism from the Jupiter’s aurora emitting light in other wavelength ranges. Observation by HISAKI and the Hubble Space Telescope in January 2014 focused on precipitations of the Jupiter’s aurora in UV. This research concluded the Jupiter’s high spin resulted in the precipitations of the UV aurora. The results of the X-ray and UV aurora suggest that the both mechanisms, the Jupiter’s rapid spin and the solar wind, cause the Jupiter’s powerful aurora phenomenon.